Hospital electric beds can be adjusted into various positions to make sleeping more comfortable and also help with getting in and out of bed. Some medical conditions require you to sleep in certain positions and an adjustable bed may be able to help. Adjustable height and profiling beds can be adjusted to change the height of the bed, making it easier for you to get on and off easier whilst the profiling option allows you to alter the position that affords the best level of comfort, whether sleeping, reading or watching the television. The beds come in set standard sizes and we use either pocket sprung or pressure relief foam mattresses. Either style of mattress can be fitted with a waterproof protector if required. Regular fitted sheets are recommended to be used as they fit snugly when the bed is raised at the head and foot ends, an ordinary flat sheet would become ‘baggy’ and ‘rucked’ when the bed is used. Electric beds fall into 2 categories, hospital and domestic, both having potential positive applications but equally both having limitations .We strongly recommend an initial assessment by one of our Occupational Therapists at an early stage if such a bed is being considered. 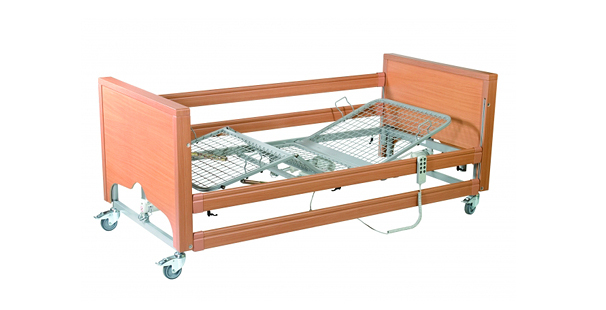 Hospital Electric beds tend to be clinical in appearance and are designed to be functional,sturdy,mobile and easily cleaned.They always have a profiling action with individual control of the head and foot motors in addition to the vertical high/low or low/high facility .These movements assist with transfers on and off the bed and also make life easier and safer for carers of different heights. Bed sizes are commonly 3ft wide with weight limits approx 20 stone but 4ft is possible with a greater weight capacity Application, Such beds can be of great help to many conditions at various stages,however equally there are occasions when an electric bed is not the solution to a set of problems.We strongly recommend you contact us and let one of our Occupational therapists discuss your individual case and let us advise you on what step to take next. 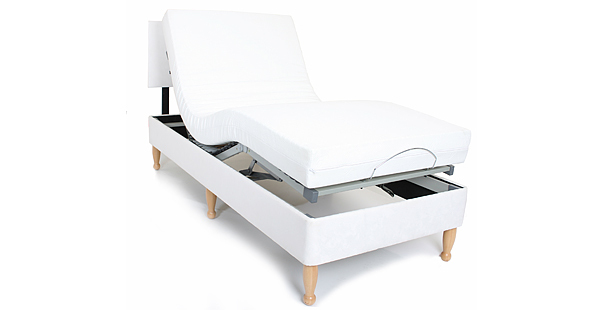 Domestic Electric Beds most commonly just have a profiling aspect with individual control of the head and foot motors.It is technically possible to offer a high /low facility but on a domestic bed this is not ideal as it makes the bed often too high and it can be expensive. Domestic beds don’t tend to be fitted with castors, are not waterproof and the fitting of cot sides or bed levers is not ideal. For use with electric beds we do recommend the use of foam based mattresses rather than pocket sprung which don’t follow the contour of a profiling bed very well.